At present, Europe is sweltering in both relative and absolute terms as the harsh summer ensues. In Australia, we are in drought after an unseasonably warm and dry Autumn. Drought is no stranger to Australia but the frequency and circumstances of the current period coupled with what is going on around Europe (including the cold spell I was caught up in Finland in February while the North Pole struggled with heat) tells us that weather patterns are changing. There is now credible research pointing in that direction. But the drought in Australia is demonstrating another thing – the hypocrisy of the way we deal with unemployment and the unemployed vis-a-vis other groups in society that we endow with higher privilege, especially in this neoliberal era. Australia is experiencing a serious drought and Federal and State governments are tripping over each other to offer very large support packages to farmers and their communities to tide them over while their income dries up (excuse the pun). There appears to be no limit to the support these governments are announcing. The Prime Minister is wandering around rural Australia promising this and that to help farmers make ends meet. Whenever I see these special assistance packages being handed out to the rural sector, which is politically well-organised, I reflect on the plight of the unemployed. With unemployment at elevated levels in Australia, the decision to hand out economic largesse to the farmers reeks of inconsistency. The unemployed have diminishing chances of getting a job at present and the income support provided by government is well below the poverty line. That poverty gap is increasing and the Government refuses to increase the benefit claiming fiscal incapacity. The comparison of the vastly different way the government treats farmers relative to unemployed highlights, once again, that the way we construct a problem significantly affects the way we seek to solve it. The neo-liberal era has intensified these inconsistencies which have undermined the capacity of public policy to achieve its purpose – to improve the welfare of all citizens. The research question is: Why do we tolerate such inconsistent ways of thinking about policy problems and their solutions? At present, Australia is enduring broad labour underutilisation rates (official unemployment plus underemployment) of around 13.7 per cent. If we take into account that the labour force participation is also below previous peak levels, then we know that hidden unemployment is of the order of about 1 to 1.5 per cent, taking the total wastage of available idle labour in Australia to over 15 per cent. The fact that this rate of wastage has persisted for many years now is testament to the flawed policies that successive federal governments have taken under the cover of fiscal sustainability. But deliberately creating this amount of labour wastage via flawed policy design has not been enough for our governments. They have also wanted to deny that the unemployed are blameless in the problem. And they have sought to punish the unemployed by ensuring that the pittance of income support that the unemployed receive stays well below the acceptable poverty line. This is neoliberalism in action. In part this blog post is about framing – how we construct a problem. Neoliberalism has adopted some very specific constructs that serve the interests of the top-end-of-town and undermine the rest of us. The issue I am dealing with today is important because it frames the way the Government chooses to segment the population by political relevance or weight, rather than one’s intrinsic rights as a citizen. For overseas readers here is some background. Unlike the unemployment compensation insurance schemes that operate in most countries, the Australian unemployment benefits system is paid by the federal government at set rates for an indefinite period (subject to Work Activity tests). Employers and employees do not contribute to the scheme and everyone gets the same rate (adjusted for marital and parental status). It was always understood that unemployment would be a relatively temporary phenomena arising as a result of short-term inadequacies in total spending, which governments could correct through fiscal policy. Unemployment was constructed as a systemic failure to produce enough jobs to match the preferences for work held by the available labour supply. It was also understood that systemic constraints are binding on individuals who can do very little themselves to ease the constraint. The unemployed can offer to work at lower wages but a firm will not take that person on even though they know the person will not cost them as much as before. The reason is that the firm would know that by taking on that worker their deficient sales will not improve much at all – and certainly not enough to justify hiring the worker. Systemic constraints have to be solved at the ‘system level’ – the macroeconomic level – through large-scale spending stimulii. When an economy is trapped in an under-full employment equilibrium there is no non-government spending incentive forthcoming and, as such, the government must take responsibility to ensure the spending gap is closed and firms have an incentive, via rising sales demand, to take on labour. In the neoliberal era, that construction changed. Accordingly, people are considered to be making choices between leisure and work that maximise their satisfaction. Anything that swings that choice towards leisure will show up in the labour force data as unemployment (or not in the labour force). For example, if the government choose to provide income support to the unemployed that is considered in the mainstream approach to be ‘subsidising’ leisure and distorting the choice in favour of leisure. Accordingly, you will find mainstream economists arguing that cutting income support in real terms will stimulate more job search behaviour and reduce unemployment. Make people desperate enough and they will do anything sort of reasoning. But the important point is that in this construction, unemployment is framed as a maximising choice and therefore unproblematic. Things have deteriorated since my last offering on this topic. In 2012, there were widespread calls from a diversity of interests in Australia demanding the Government increase the income support for the unemployed. On November 29, 2012, a Committee of the Australian Senate (our upper house in Federal Parliament – the “states house”), set up to consider the issue, produced a – Full Report – but failed to deal with the problem adequately. This was a Labor government at the time. Firmly entrenched in neoliberal myths. At a time when unemployment was rising sharply, the Government eschewed any direct policy intervention including raising the unemployment benefit on the grounds that it would damage the fiscal position! Aside from the work disincentive effect associated with options that involve lifting base allowances by a significant amount … In a climate of fiscal constraint, it remains important to consider expenditures on income support alongside other public expenditure priorities and to note that the position of people out of work is also assisted through investment in taxation measures, employment services and broader social policy and program reforms. There was no reason for imposing fiscal austerity at the time with the broad labour underutilisation rates high, inflation low and real GDP growth subdued and insufficient to absorb the new entrants into the labour force into employment. 1. The question of equity (and this group is living in poverty as a result of mean-spirited government policy) – how should we treat different groups in society – especially those in poverty which are often also enduring unemployment. 2. The risk of inflation – will expanding the unemployment benefit blow out nominal aggregate demand growth relative to the supply potential of the economy? If so, what other policies are required to maintain price stability? If the answer to the second question is yes and the first is that more equity is required then a combination of unemployment benefit increase and rising taxes on higher income earners would be indicated, for example. In fact, there is no inflation threat that would arise from restoring some relative equity between income support recipients. As a technical matter, the Australian Government, as the currency-issuer, could increase the unemployment benefit with the stroke of a computer keyboard. It was introduced when unemployment to vacancy ratios rose – sometimes to around 10 to 1 – currently around 3.4 and that is not counting the mass underemployment that is a more recent manifestation of the failure of the economy to produce enough jobs. 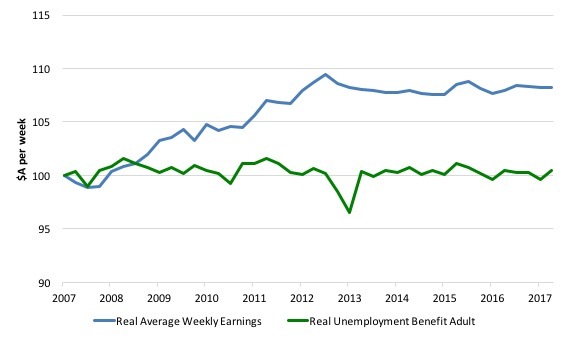 It was obvious the economy was not producing enough jobs, yet to disguise that policy failure, a full-blown attack began on the unemployed and the narrative shifted to claims their allowances were too high and were undermining incentives to work. Quite simply, it was argued that our disadvantaged citizens preferred the pittance that the government provided them by way of unemployment benefits to working despite the fact that the former life opened the person to public humiliation, vilification from the media and civic leaders, and poverty. 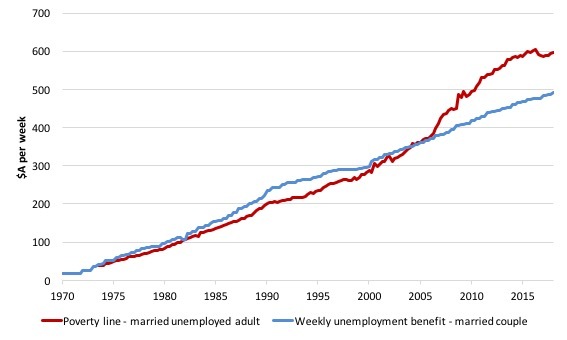 The next graph shows the weekly unemployment benefit for married couples and the corresponding poverty line. The interesting feature is that the deterioration in the situation for married couples came when the conservatives were elected in 1996. The current Labor government (elected in 2007) accelerated that deterioration. See yesterday’s blog post – CEO pay binge in Australia continues while workers’ wages growth remains flat (August 6, 2018) – for more discussion on this point. Since the December-quarter 2007, real average weekly earnings have grown by 8.2 per cent, which is pitiful. And to put a fine point on that performance, all that growth came between December-quarter 2007 and the December-quarter 2012. Since then real average earnings for workers have not changed. Real unemployment benefits have not improved at all. So the Government has deprived the unemployed of enjoying some of the benefits of national productivity gains. 1. In this neoliberal era, successive governments have framed unemployment as being a choice made by individuals who are too lazy to work or are otherwise incentivised to remain jobless. 2. Society in general has accepted that view which shows no respect for the unemployed who are in that state because circumstances beyond their control changed and they became the victims of those changes. Enter the latest drought in Australia. Then we see how framing really matters. Here is the problem. 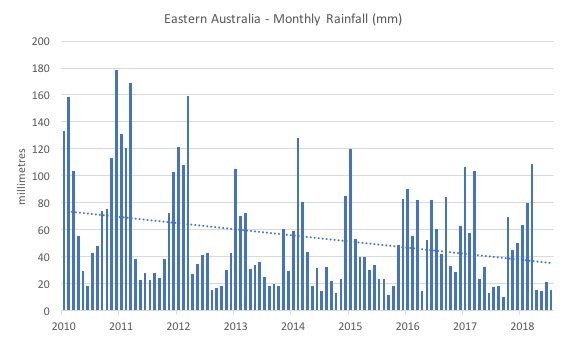 The graph shows monthly rainfall (mm) for the Eastern Australia from January 2010 to July 2018 (data available from the Bureau of Meteorology). The downward sloping dotted line is just an Ordinary Least Squares trend. The recent period has seen very little rain. If I drilled down to some of the Eastern rural growing areas the situation would be even more stark. The Bureau reports that the Autumn rainfall in 2018 was the lowest since 1902. But other data shows that while the current drought is serious it is not the longest dry period in history or the driest. But quibbling over facts is not the point of the blog post. The Australian government and NSW State government (where the drought appears to be worst) have acted quickly to provide massive support for the farmers. Cash payments of around $A28,000 a year are available via the Farm Household Allowance (FHA) scheme. This is higher than what a person would get on unemployment benefits. In addition, free medical support (mental health) is being given and the Rural Financial Counsellors scheme has been expanded significantly. Further, low cost loans are being provided to farmers. The NSW State government announced that it would reintroduce freight subsidies for animal feed and water in addition to extra cash payments to farmers. It is waiving “Local Land Services rates, fixed water charges and class-one agricultural vehicle registration costs” (Source). The Federal government is to announce further monetary support for farmers soon. All sorts of additional help is being given – the Agriculture Minister has hassled the banks to provide stays on loan payments; hay deliveries are being subsidised, etc. In other words, a very generous tax minimising scheme in good times. As far as I can tell, all the new aid being given in this current period does not require farmers to draw down on that fund even though as at June 2018 there were 54,569 accounts being held and $A6,618,609 thousand deposited (Source). For a full range of support to the farming community from the Federal government see the – Drought and rural assistance portal. The Department of Human Services, which oversees Federal income support notes that “There are occasions when you may experience exceptional circumstances that are beyond your control, such as a severe drought” which means you can receive special extra assistance and are exempt from any activity tests, which are imposed on unemployment benefit recipients. All the assistance is aiding farmers who are unviable at present. But there is no alignment with that situation and the situation of an unemployed person. 1. What is the difference between an urban/rural worker (say) who loses his/her income because their job (productive activity) vanishes and a farmer who loses his/her income because their job (productive activity) vanishes as a result of changing global or national economic circumstances? 2. 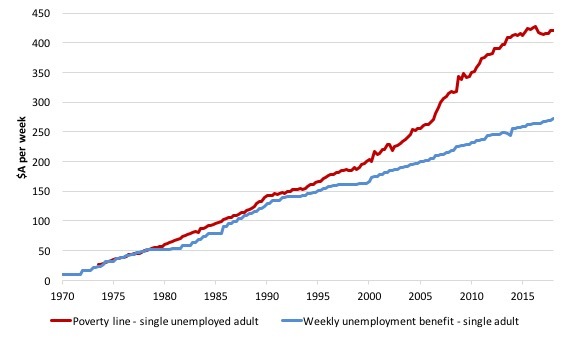 Why is one job loser able to access crisis relief (which is generous) and the other job loser is only able to access unemployment benefits which now provide below-poverty line income support in Australia? 3. Why is an unemployed worker not able to access concessional loans on their property to help them through the crisis, when clearly their plight is beyond their control? Now take this thinking a step further. Why have we ignored all the developments in alternative farming (permaculture, natural sequence farming, organic and bio-farming) up unto now? However, we could have constructed the problem in a different way. There is evidence that sustainable agricultural practices can cultivate drought-resistant farms, even in areas where conventional farms have suffered badly. Even in the current environment, some farmers are expressing concern over the very generous handouts being given to farmers by the Federal government. Farmers are concerned the media is focusing too heavily on drought disaster stories that are damaging the reputation of Australia’s livestock industry. Further, other farmers interviewed talked about how farmers needed to better prepare for the inevitability of drought and look after their environments better. They indicated that “those who have been hard-headed and planned for this” are able to get through the drought without emergency assistance. So when constructing (framing) this problem, should we therefore focus on the ‘deficiencies’ of individual farmers and ignore the systemic crisis that drought brings. Should we highlight their lack of skill or poor motivation or reluctance to plan for bad seasons? The scale of loss in income arising from unemployment (and underemployment) dwarfs the losses arising from drought or problems caused by exchange rate movements. That is not an opinion – it is a fact – easily documented. How many times do you hear our parliamentarians or the central bank officials or treasury heads expressing an urgent concern about the ‘unemployment problem’ and advancing direct policies to generate jobs for all who are willing and able to work? The costly acceptance of the status quo raises the following question for all of us. Why do we always have such an urgent concern about farm problems – which are smaller in income lost and affect significantly less families and children – yet adopt such indifference to the unemployed? The answer lies in how we construct the problem. We have been repeatedly told that unemployment is the fault of the unemployed. The solution then focuses on making the unemployed ’employable’ rather than on ensuring there are sufficient jobs. We arraign our most disadvantaged citizens with accusations that they are lazy and unskilled claiming that they could get work if they tried harder or changed their attitude. Meanwhile, we blithely ignore the failure of macroeconomic policy to ensure there are enough jobs available despite the evidence for unemployment as a ‘systemic failure’ being as compelling as meteorological data, for example, showing a lack of rain. Whenever we think about a policy problem there are many constructions that are possible. The way we construct the problem is often driven by the dominant ideology which probably caused the problem in the first place and has no real stake in actually solving the problem at its elemental level. On Thursday, I will address the latest comments from British Labour Party advisors about how an application of MMT principles to British fiscal policy would destroy the currency. That is a perfect example of a false construction. (c) Copyright 2018 Bill Mitchell. All Rights Reserved. What I do not understand is why, with all the claims that MMT relies on, why it has not gone through the courts instead of continuously getting in slinging matches with other agenda pushers within the political and economic arena. If the JG program is so good and can be proven to be implemented without it costing property owners a cent or otherwise causing them economic loss (or causing inflation), or if, property owners would not be able to prove in a court setting that such a program would cause them loss or inflation (such as those claims made by Palley), then why would you not pursue the court avenue instead? What’s more, if MMT is right in the sense that a JG program does not cause economic loss to property owners or whoever else wants to complain about it, then it must also stand that any program which deals with reducing homelessness to zero must also be able to be implemented without cost to anyone. If human rights advocates have the courage to take matters to a court when laws are passed (usually pushed by neo-liberal types) which punish the homeless and destitute, and can have these laws declared void and overturned on grounds of human rights, common law rights, and on constitutional grounds, then why can’t MMT or other economists who are selling themselves as ‘for the workers’ do the same in relation to employment (i.e. JG program)? It should be no surprise to anyone that one must have some level of access to resources in order to obey the law (something homeless and destitute don’t have), which means under a property based system where all human needs are treated as commodities the only two means (other than already possessing sufficient wealth) in order to obey all laws are welfare/charity or a job. If neo-liberals, or the elite, or the owners of the means of production or whatever you want to call them don’t want people on welfare, then all that leaves is jobs – there is no other way for any human being to gain access to the resources necessary to obey all laws unless they have a job. This then constitutes a ‘right’ in and of itself (a property owner cannot ask government to enforce property laws to protect their property and at the same time expect others who have no means to still be able to obey all laws when it is by virtue of their property ownership that others can’t obey the law – this is in breach of the maxim that he who seeks equity must do equity). Create the damn policy proposal, take it to court, and have the government and their neo-liberal advisors ‘prove’ in court that a JG program will cause property owners loss or cause unstable inflation (whilst you’re at it, have government answer why, if they are so concerned with keeping inflation expectations stable, why have they no concern over the other factors which contribute to price instability such as higher distributed profit ratios caused by ever increasing demand for assets, both real and financial, and other forms of speculation). When they can’t prove it, the court declares the policy proposal as lawful, not in any contravention of any laws or contracts, that those who are unemployed are entitled to work proposed by the policy, and as the law stands and has stood for centuries now ‘when one can prove an entitlement, the Crown will honour it’. The only defence I can see the other side presenting, is that there is nothing within the JG program which would prevent all the increased wages being used in speculation. I have yet to see any remarks by any economist that deals with this. But anyway; we already have everything within the legal system to have a JG program pushed through without political rangling – and I am compeltely perplexed as to why this avenue is not pursued when human rights advocates pursue it for all other human rights. To be frank, it makes me suspicious. I assume, your reference at the end of your excellent post today is a reference to recent utterances of James Meadway who seems to be rehashing the oft met comment that MMT only applies to the US because of the reserve currency status and would be ‘catastrophic’ for the UK. Wray and yourself have dealt with this issue many times but for some reason, these people seem oblivious to it. Meadway has a first class degree from LSE, so maybe neo-liberalism has finished him off but you’d think he’s be able to read the literature that has been around for some years! Dean:What I do not understand is why, with all the claims that MMT relies on, why it has not gone through the courts instead of continuously getting in slinging matches with other agenda pushers within the political and economic arena. Sure, there could be legal grounds for it now, and in the future, a JG job should certainly be justiciable right, but I think most MMTers, even most MMT lawyers would think that a purely legal strategy has a snowball’s chance in hell. It is based on a touching faith in courts to enact the “right”, essentially political policy. That’s just not how the world works. The only precedent in US history of comparable scope I can think of is Dred Scott – Taney thought he was protecting important rights too. That didn’t end well. Look up Flemming v. Nestor too for how it would go in the USA. And the US gives more power to courts than almost any country. Many countries have had full employment and JG-oid policies, but if you know of any which was even partially instituted judicially, I would be surprised. Philip Harvey of Rutgers has written the most as far as I know on MMT and job rights from an American and international perspective; don’t remember if he has addressed this question, you could look. Basically before the time of Locke, one’s labor was considered a kind of property. A JG program can be considered as a restoration, a re-recognition of that pre-modern view. So not having a JG is a clear infringement of property rights. Remarkably, some economists from both the right and left (the US CEA, Herb Stein) did agree on that at the height of the postwar Keynesian full employment era. So the idea of a JG infringing on property rights so considered is gibberish. And economic logic and experience and common sense shows that infringement on other property rights is preposterous; even though that sort of infringement is the kind that governments do without compensation all the time. What does “speculation” mean here? Whatever you are worried about, I think it is a non-existent or trivial problem or one that is worse under a system without a JG. I think workers would use their decent wages to have a decent life – housing, eating, entertainment etc. The distributional consequences are clear in theory and practice across the world – full employment makes the rich/poor divide smaller – rather obviously. That’s why “economic royalists” hate it so much; they and Marx and some Marxists understood how powerful it is. That’s why it was considered a “transition demand” to a socialist society. I mean, one is, you are welcome to try, but before such a suit has a real chance – even for propaganda purposes – one needs to lay the groundwork by doing the same things the Abolitionists, the anti-slavery societies, civil rights movements across the world have done – and that is to explain the ideas and their logic. And that is what Bill and the other MMTers have been doing for a long time. Although the legal argument wasn’t founded on MMT principles a case was brought forward in Canada. A group of citizens launched a suit against the government of Canada, in an attempt to restore the use of an existing (and technically still in effect) act of parliament which allowed provinces who do not issue money, to borrow from the federal government which does, at zero interest. That legislation had been used to build public hospitals and other vital infrastructure between 1938 when the act of parliament was put into effect, until the dawn of the neoliberal era in Canada began, unannounced to the public, in 1974. Those dates mark the beginning and end of the progressive era for Canada. The COMER group and their lawyer perhaps thought that they had a rock solid case, because of the prior existing act simply be ignored by federal governments, however the case went all the way to the supreme court which decided the matter was a political one rather than a legal one. There are plenty of people worldwide, whose livelihood and good health have been harmed by the neoliberal fiscal policy implemented by national governments. That means there are plenty of potential grounds for claims being made, after all we live in an era were trade agreements give corporations the right to sue for even perceives losses of future profits due to government regulation; but would they grant an MMT based argument any more legitimacy than a preexisting law, given the current political climate? How things were done (successfully) before the neoliberal era. Worth a look. “I assume, your reference at the end of your excellent post today is a reference to recent utterances of James Meadway who seems to be rehashing the oft met comment that MMT only applies to the US because of the reserve currency status and would be ‘catastrophic’ for the UK. The UK Labour Party’s economic advisors have all gone authoritarian and refuse to respond to Richard Murphy’s probing criticism of the economic advice they’ve been giving to the Shadow Chancellor, John McDonnell. This is especially rich given that the Labour Leadership advertises itself as a big improvement on the Tory-Lite authoritarian style of Tony Blair by increasing democratic participation in party decision making! Australia’s unemployment benefits put one squarely under the poverty line. If you are out of work, you have to use the benefits. If you are working, that would cancel the benefits right? So, you are basically trapped in poverty while Australia is physically perfectly capable of maintaining a basic standard of living for everyone. Cruelty to the poorest at its finest. Telling people that they are lazy is to abdicate responsibility. Do you have the names of those cases, particularly the supreme court case ruling it a political issue? It would make sense to label something a political issue if the right is not pre-existing, which is whole purpose of politics, to create new or extinguish old rights; the courts are only concerned with pre-existing rights/entitlements (which is why I find it difficult to fathom a political approach for something that is claimed to be a pre-existing right – sorry if I appear naive). The Menzies government tinkered with the housing mix. “There was quite a move away from public housing,” Lionel Frost, an associate professor of economics at Monash Business School, says. Menzies’ government created incentives for renters to purchase their houses, if they rented from the Public Housing Authority. “It was a very much hands-off approach by the Commonwealth government at the time,” Associate Professor Frost says. After World War II, waves of migrants came to Australia from England, Ireland and Europe. Greeks and Italians, in particular were keen to own their own homes. “They have a very strong preference for having their own home, because it provided an opportunity not available in Britain or Europe,” Associate Professor Frost says. By the mid 1970s Australian home ownership had reached something of a saturation point: 70 to 75 per cent.